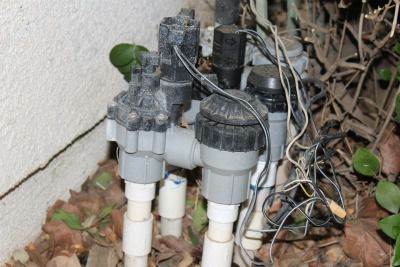 Replacing a broken or leaking sprinkler valve in a home irrigation system is a common repair that can take less than an hour to complete. But before you start, it's important to examine the system carefully to confirm that the problem is due to a bad valve and not another cause. Common symptoms include leaks around the valve or at the sprinkler head farthest from the valve, inadequate water delivered to the sprinkler heads, or the sprinkler heads simply not coming on. 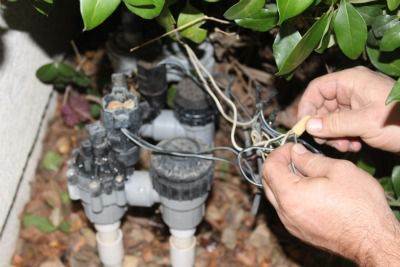 Perform some troubleshooting to isolate the valve as the problem area before replacing the valve. 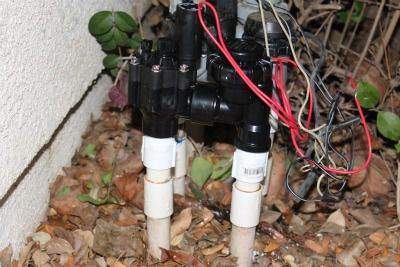 Note where the wires are attached to the old sprinkler valve. This is important because you must connect the wires to the new valve in the same way. It's a good idea to arrange the wires so each can be seen clearly, then take a photo of the wiring with a smart phone or digital camera. When you're ready, disconnect the wires from the sprinkler valve. 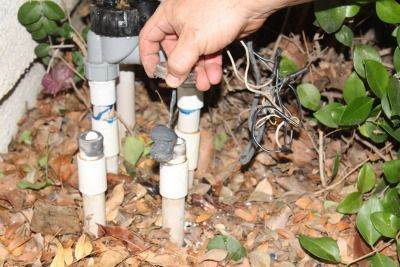 Cut through the PVC irrigation pipes just below the old PVC adapters, using a reciprocating saw, hacksaw, or PVC pipe cutter. Cut as closely as possible to the old fittings to conserve the maximum amount of pipe length. The new sprinkler valve will be only slightly lower than the old one. Remove all plastic burrs around the cut edges with a utility knife or sandpaper, being careful not to let the debris drop into the pipes. 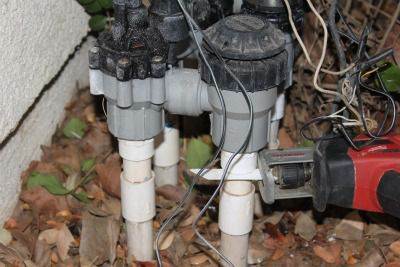 Note: With the system shown here, the local code requires that the anti-siphon sprinkler valve must be at least 6 inches above the highest sprinkler head in the same zone, when the head is in the popped-up position. 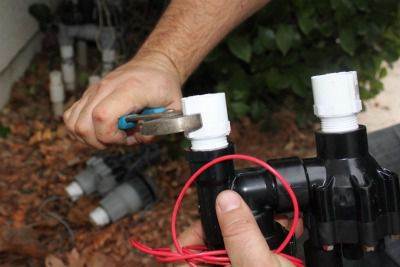 Install the new PVC male (MIP) adapters into the new sprinkler valve by wrapping plumber's tape around the threaded end of each adapter and threading it into a valve socket. Tighten all of the adapters with channel-type pliers, being carfeful not to over-tighten them, which can crack the plastic parts. 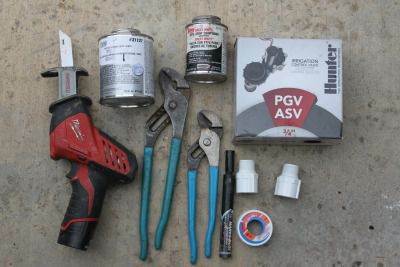 Apply PVC primer and solvent glue to the insides of the female adapter sockets and on the outsides of the pipe ends, following the manufacturer's instructions. Fit the new valve onto the pipes, pushing down until the pipes stop inside the adapter sockets. Connect the wires to the new valve in the same configuration used with the old valve. Let the PVC solvent glue dry as directed by the manufacturer (usually about 30 minutes for full strength). 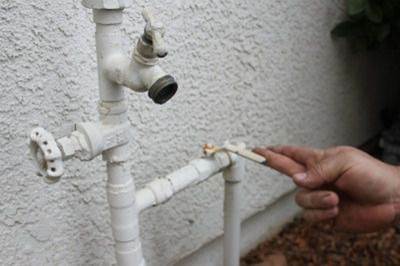 Turn the water back on by slowly rotating the shutoff valve's handle so it is parallel with the supply pipe.